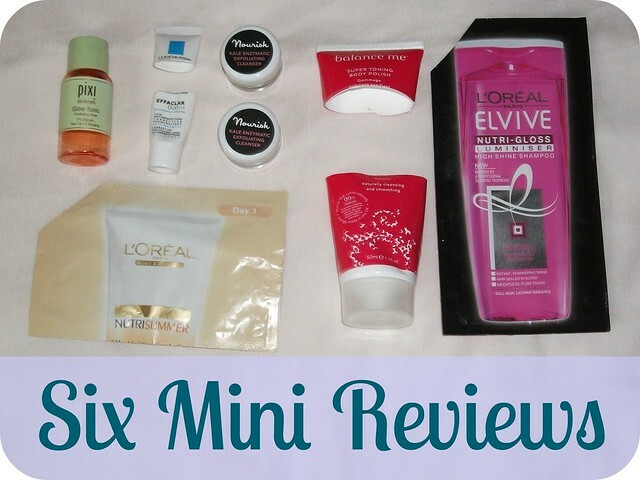 I've been powering my way through the beauty samples over the last couple of weeks and have amassed a fair few sachets and mini tubes to throw away, so it's time to share the next installment of my Six Mini Reviews; a brief run-down on my thoughts on each sample, along with whether or not I plan to buy the full-sized product! Pixi Glow Tonic Beauty Elixir | I received this dinky sample bottle in my Latest In Beauty Glamour Summer Edit box and managed to get a week's worth of use from it, using it morning and evening after cleansing, as suggested. Aside from a slightly sharp scent (which I really liked, but my mum wasn't so keen on), I could barely tell I'd used this - except for, during "that week" of the month when my skin is usually at its worst, it was the best it's been in months - barely any break-outs, way less redness, and all-round smoother and brighter. The full-sized bottle is £18 so it'd be a bit of a splurge but I'm seriously considering a wee purchase! La Roche-Posay Effaclar Duo+ | This was a sample I signed up for on La Roche-Posay's website, I think; I got a few days' use out of the 3ml sample, using as a moisturiser in the morning and a serum in the evening. I found it nice to use, with a light texture that absorbs easily and leaves my skin feeling soft, smooth and matte, but I didn't find it to keep my skin matte for any longer than usual. Maybe that would be a longer-term effect? I don't know. I would have purchased the full-size if only the £5 off voucher included with the sample hadn't expired by the time I received it - good work, La Roche-Posay! 40ml will set you back £15.50 which isn't too outrageous, so I might buy the full-size yet. Nourish Kale Enzymatic Exfoliating Cleanser* | I was sent these two tiny sample pots and surprised myself by managing to get two uses from each one, so four in total. Described as containing Pomegranate enzymes for gentle exfoliation and Kale to improve skin's suppleness, I don't feel like four uses is enough to comment on those claims - what I can say, however, is that this had a gorgeous balm-like texture which felt really lovely and luxurious on the skin. My skin was left feeling really clean but soft, smooth, calm, and nourished rather than stripped or tight. At £16.50 for 50ml of product, this isn't the cheapest, but as I have demonstrated a little goes a long way and I'd definitely be interested to see what it could do for my skin in the longer term. L'Oreal NutriSummer Body | I couldn't even tell you how long I've had this sample sachet. I have no idea. That's kind of gross, right!? Anyhow, I've used it now, despite not being a tan kind of girl; I didn't notice any difference, but then again I wouldn't really expect to given that this is meant to be a gradual tanner... It did feel nice and hydrating on my skin and absorbed quickly without leaving a greasy residue, which is nice, but I don't feel like one use (or even two, as I presume there was originally a Day 2 sachet since this one is labelled Day 1?) is enough to judge the effects of a product like this. I don't think this is even still available to buy. I feel a bit disgusting now. Please don't judge me. Balance Me Super Toning Body Polish | This sample was also included in the Latest In Beauty Glamour Summer Edit and once again, I was quite underwhelmed, which seems to be a recurring theme with Balance Me products. The texture was nice and the scent was beautiful but I didn't feel like I got much of a scrub from it before it kind of melted away - even when I tried using it on dry skin before I turned the shower on. I will not be shelling out £18 for the 150ml tube, that's for sure! L'Oreal Elvive Nutri-Gloss Luminiser High Shine Shampoo | I use these magazine sample sachets of shampoo knowing full well that I'll never buy the full-sized bottles as my skin can't handle the SLS if I use them regularly. Regardless, it makes a nice change and I do love trying new things! I wasn't impressed with this, to be honest; although it lathered nicely and there was enough to shampoo twice, even with my long thick hair, I didn't find that my hair felt smooth and glossy, as promised. It also did not work well with my oily scalp, and my hair looked lank and horrible by the next morning, when I usually wash every second day. At £3.99 for 400ml this is pretty affordable, so maybe worth a try if your hair is less prone to oiliness and you're okay with SLS, but I won't be buying it. I'm on a bit of a throwing-things-away binge at the moment so I'm super glad to be able to clear out this little lot - it's so satisfying!! Have you tried any of these products? What were your thoughts? What's the best product sample you've tried recently? The Balance Me items I have tried have been underwhelming as well! omg i really want to try the pixie one! but i need a sample first before purchasing it!